Revision of: 8-Week blood sugar diet recipe book. 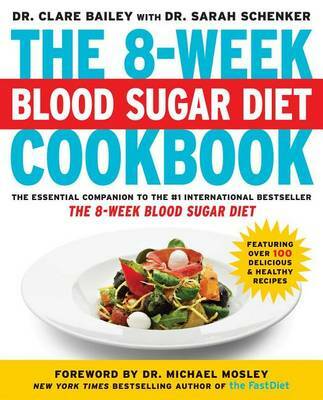 Combat diabetes with this essential companion to New York Times bestselling Dr. Michael Mosley s groundbreaking The 8-Week Blood Sugar Diet, featuring over a hundred delicious and healthy recipes. The 8-Week Blood Sugar Diet revealed new, staggering scientific studies on diabetes and demonstrated a revolutionary 8-week plan, including an 800-calorie daily diet, to reverse the disease s effects. Now continue battling diabetes with these simple and delectable recipes that can lower your blood sugar level and help you shed unwanted pounds. Also discover updated nutritional advice, tips for home cooks of every skill level, and detailed menu plans. It s never too late to fight off diabetes, and with the recipes in The 8-Week Blood Sugar Diet Cookbook, it s possible to ensure more long-term health benefits in an easy and effective manner! Dr. Clare Bailey is a general practitioner doing diet research with Oxford University. She is the author of The 8-Week Blood Sugar Diet Cookbook, and is married to Dr. Michael Mosley, author of The Clever Gut Diet, The Fast Diet, and The 8-Week Blood Sugar Diet. She is also founder of Parenting Matters, an organization that helps parents become more confident through courses and one-to-one consultations. Dr. Sarah Schenker is a Registered Dietitian and Nutritionist who has served on both professional and government committees. She now combines her sports nutrition work, consulting for football clubs in the UK, with regular appearances on television and writing for scientific journals, as well as for newspapers, magazines, and websites. Dr. Michael Mosley is the #1 New York Times bestselling author of The FastDiet, FastExercise, FastLife, and The 8-Week Blood Sugar Diet, and The Clever Gut Diet. Dr. Mosley trained to be a doctor at the Royal Free Hospital in London before joining the BBC, where he spent three decades as a science journalist and executive producer. Now freelance, he is a well-known television personality and has won numerous television awards, including an RTS (Royal Television Award), and was named Medical Journalist of the Year by the British Medical Association.